This page is dedicated to member(s)/person(s) and/or groups who have contributed to the O.N.V.C. and to recognize their time and efforts to the Club. Sunday, March 12th, 2017. The Club received a wonderful letter of thanks. The letter was read aloud during the March Monthly General Members Meeting Please Click here to view the letter on the Club's Facebook Page, a great read. Bravo Zulu. Sunday, January 8th, 2017. The ONVC would like to thank the following individuals for their contributions to making this year's "Festive Wheelbarrow Draw" a huge success. They are as follows: Ticket Sellers (Bar Staff) = Sandy, Danielle, Clare, "Pitcher" and Larry. (Members) = Ted Kibby, Andy Bak, Mark Poulton, John Cook, Jimmy Cook, Tom McVey, Chris Nichols, Lisa McKay, Brian Wilkins, Jules Hill, James Huff and Cathy Shea. (Friends of the Club) = Nadine Shea, Ivan Kralj and Darrel Boyd. Efforts by these individuals raised a total of $3,410.00 for the Club's Building Accessibility Fund. Thank you all for the great work! Bravo Zulu!. Sunday, May 24th, 2015. Today marked the first time that ONVC Members have been recognized by the RCNA National for contributions to their respective RCNA Association. These Members were submitted to the RCNA and met the necessary criteria to receive these new RCNA Recognition Medals. Today, the ONVC is proud to announce the following recipients. They are as follows: Andy Bak, Larry Smith, William Holroyd, Jane Kibby, Russell Gregg, E.J. "Ted" Kibby, Rod Ayre and Robert Perks. All medals were presented by the Club's Master at Arms Brian Wilkins. Click here, to view our Facebook Page album of recepients. Sunday, March 1st, 2015. The Club would like to thank Shipmate Steven Kaye. Steve offered his expertise and knowledge in refrigeration. Steve was able to direct the Club in acquiring all parts and equipment to replace the cooler on our Nautical Deck that had recently expired, it has been long overdue (decades!) to be replaced. He then donated his services and installed the new unit over a three day period. His efforts saved the Club thousands of dollars and we now have a brand new cooler that functions fantastically! Bravo Zulu Steve and thank you again. Tuesday, January 27th, 2015. The Club would like to thank all ONVC Members and friends of the Club for this year's generous donations of gifts and non perishable food items. Executive Members Bill Holroyd (President) and Les Nichols (Executive Committe Chair) delivered a truck load of items to the Simcoe Hall Settlement House Food Bank (SHSH FB). The SHSH FB thanks the Club and it's Members for their generous donation. Bravo Zulu to all! Click here, to view a few Facebook photos taken by Christine Lessard. Friday, August 15th, 2014. The Club would like to thank Shipmates Bill and Heather Peter with the donation of ammunition for the Club's Colour Guard. The Club's Guard always puts it to great use Bravo Zulu Shipmates! Tuesday, May 27th, 2014. The Club would like to thank Shipmate Rod Brocanier and his wife Nancy with the donation of chairs for the Club to use on our patio. They add excellent seating and they are excellent to soak in a bit of sun for some vitamin D. Bravo Zulu Brocaniers! Sunday, May 4th, 2014. The Club would like to thank everyone who volunteered, participated and/or attended our Annual Battle of the Atlantic Dinner, Parade and Ceremonies. Without you all, this event could not happen. Bravo Zulu to all! Thank you. Sunday, February 9th, 2014. The Oshawa Naval Veterans' Club would like to thank Shipmates Bill and Heather Peter on their donation of a floor polisher. It will be put to good use. Thank you Shipmates! Saturday, December 14th, 2013. The Oshawa Naval Veterans' Club would like to thank all the volunteers who made the ONVC Annual Turkey Dinner another great success! Over 80 tickets were sold and great fun was had by all. Can't wait till next year. Thank you again to all who volunteered and who attended this fun event. Saturday, December 15th, 2012. The Oshawa Naval Veterans' Club would like to thank all the volunteers who made the ONVC Annual Turkey Dinner another great success! Over 80 tickets were sold and great fun was had by all. Can't wait till next year. Thank you again to all who volunteered and who attended this fun event. Thursday, December 13th, 2012. The Oshawa Naval Veterans' Club would like to recognize fellow ONVC Shipmates/Members whom all received "Queen Elizabeth II Diamond Jubilee Medals". These individuals were nominated and awarded these medals in recognition of their contributions within their communities. The Oshawa Naval Veterans' Club is proud to have a total of 7 recipients of this prestigous medal within it's Membership. The recipients are, William Askew, Patrick Chappell, E.J. Kibby, Robert Perks, Des Steele, Brian Wilkins and Donald Wilson. Congratulations Shipmates! Tuesday, November 27th, 2012. The Oshawa Naval Veterans' Club would like to thank everyone who contributed non perishable food items for the Simcoe Hall Settlement House Food Bank. Executive Members Robert Perks, William Holroyd, Terry Fairey and Rod Ayre were on hand during a presentation today at 1100 hours at the food bank to donate all collected items and a cheque from the Club to the director of the food bank. Media outlets CHEX Television and SNAP Oshawa were also in attendance. Thank you everyone for assisting in this worthy cause. Monday, November 26th, 2012. 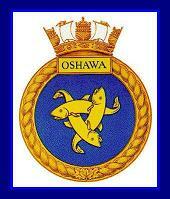 The Oshawa Naval Veterans' Club would like to thank everyone who participated in the events of last weekend. Even though the attendance of the Charlie Rines Memorial Dart Tournament was lower than expected, it was a great success and a great time was had by all, prizes. Food and draws were all excellent! The winners of this year's tournament was Brenda Nichols and Bruce Tillson. See you next year. Thanks also go out to all who attended the 100th Grey Cup on Sunday, we had a record for attendance and perhaps had the biggest laugh in years when the Club's very own Argonaut Cheerleader made an appearance during the game, great show Jimmy Roy! Can't wait for the Superbowl to see what he wears next. Great job by the "Tugboats" for putting on a great weekend. Keep up the good work. Sunday, November 18th, 2012. The Oshawa Naval Veterans' Club would like to thank the Club's Sports Chair for paying the Club's 2013 City of Oshawa Permits of $500.00. Please support events held at the Club as it is support like we recently had that greatly assist the Club financialy. Thanks Andy! Sunday, November 11th, 2012. The Oshawa Naval Veterans' Club would like to thank Bill Peter for his generous donation of 100 rounds of ammunition to the ONVC Colour Guard. The new ammunition performed extremely well during the Remembrance Day ceremonies at Memorial Park on Sunday, November 11th. The increased volume and flame were enjoyed by many who attended the ceremonies. Thanks Bill!. Sunday, September 9th, 2012. Jackie Parker thanked Robert (Bob) Perks and the Oshawa Naval Veterans' Club for arranging the pallbearers for Howard's service. She advised that Howard would have been very happy with the service and provided a card to the Executive to be read at the September 2012 General Members Meeting. Friday, August 17th, 2012. The ONVC would like to thank James (Jim) McCabe for the awesome Gazebo that covers the whole BBQ section and the standing bar of the patio. This additional cover helps anyone BBQ'g or for anyone looking for additional shade or cover from rain. Thanks Jim! Sunday, June 10th, 2012. The ONVC would like to thank Ken Gillespie and his friendly assistant Andy Bak for organizing another successful Golf Tournament. The rain held off and a excellent time was seemed to be had by all! Thanks boys, see you next year! Thursday, May 3rd, 2012. Thank you to all ONVC Shipmates who have graciously volunteered their time and efforts in the refurbishment of our flagpole. The flagpole is now repaired and looking brand new. Special thanks to the volunteer and helper in the lowering and rising of the flagpole. The efforts and work performed is a perfect example of community spirit the ONVC wishes to promote. Kudos to all! Saturday, March 10th, 2012. Thank you to the "Tugboats" members for their organizing a wonderful dart tournament for the 14th Annual Charlie Rines Dart Tournament. An excellent time was had by all. Great job guys! Sunday, January 8th, 2012. Thank you to Shipmate Brian Wilkins for donating another James Rowlands canvas oil painting. His generous gift is sure to raise funds to the Club's treasury and to make the lucky winner very happy with some added art to their home. The winner of the previous painting was Michael Ruckstuhl. December 2011. Thank you to Shipmate Brian Wilkins for negotiating with the owner of New Building Solutions (Harold Cottom) for a new thermal modular shed. This new shed provided to us by Harold will greatly improve our much needed outdoor storage needs. Saturday, November 19th, 2011. Thank you to Shipmate Brian Wilkins for donating the James Rowlands canvas oil painting. His generous gift is sure to raise funds to the Club's treasury and to make the lucky winner very happy with some added art to their home. Saturday, November 5th, 2011. Thank you to the "Tugboats" members for their organizing a wonderful dart tournament in "Tugette Kathy"'s memory. An excellent time was had by all. Great job guys! Sunday, September 11th, 2011. The O.N.V.C. Ladies Auxiliary that was discontinued in November 2010, completed their final task of presenting their outgoing gift to the Ladies Auxiliary President Jane Kibby! Click here, for a couple of photos of the presentation. The O.N.V.C. sincerely thanks the outgoing auxiliary and members of all past auxiliaries whom have contributed to our great Club, you will be missed. Bravo Zulu! Click here, for a photo of the gift presented to Jane. Thursday, September 8th, 2011. Thank you to Ken G, Dave L, Larry S, Les N, Andy B, etc... (sorry if I forgot anyone) for their excellent rug installation for the 9 dart boards that our Lower Deck now has. Looking great for the O.N.V.C. 's "Thursday Night Fun Darts" League, the O.D.D.L. and the Wednesday night darters. Great work guys! Click here for pictures of the new rug! Thursday, September 1st, 2011. Thank you to the "Tugboats" members (Larry, Andy, Bill and Les) for their efforts and work in adding another dartboard for ODDL functions, Wednesday and Thursday evening darts! Great work guys! Sunday, June 12th, 2011. The ONVC would like to thank Ken Gillespie and his friendly assistant Andy Bak for organizing another successful Golf Tournament. The rain pretty much held off (at least to the end!) and a excellent time was seemed to be had by all! Thanks boys, see you next year! Sunday, May 1st, 2011. The Oshawa Naval Veterans Club would like to thank Senior Chief Petty Officer USN Bill Thompson as the guest speaker for the ONVC's 2011 Battle of the Atlantic Dinner as well as Petty Officer 2nd Class USN Jennifer Thompson for attending this event. The Oshawa Naval Veterans Club also thanks Regional and City Councillors Bob Chapman and Tito-Dante Marimpietri, City Councillor Bruce Wood and our Padre for their participation and attendance for this important annual event. Attendance by all was and is sincerely appreciated. Thank you. Tuesday, February 1st, 2011. The Club would like to thank Ken Gillespie, Les Nichols, Bill Holroyd, Rod Ayre and Larry Smith, they have all contributed in one way or another for the set up of our new HD TVs, from picking them up at the store to setting up wall mounts and fine tuning the units, thanks again guys, these TVs definitely enhance our Club. Tuesday, February 1st, 2011. The ONVC would like to thank Christine Lessard for the donation of a new telephone and answering machine. The telephone is an upgrade from the previous one we had. It will assist any staff members who may be working a function on our Nautical Deck as well as our Tuesday and Wednesday Euchre players. It also has a recording to advise callers of our hours of operation and when to call back if we are closed. Sunday, December 19th, 2010. The ONVC would like to thank all the volunteers who assisted in making the Anuual Christmas Turkey Dinner a success once again this year, they are as follows: Bill Holroyd, Brenda Nichols, Christine Lessard, Donna Ayre, Jane Kibby (for cooking turkeys), Kathy Wodnisky, Les Nichols, Mike Wodnisky, Rod Ayre and Terry Holroyd. Thank you also goes out to Mark Elliot for donating the turkeys and Ted Kibby for donating the wine during the dinner. Without these individuals, the dinner could not have taken place, thank you once again. Sunday, December 19th, 2010. The ONVC would like to thank the Holiday Inn Oshawa for the donation of chairs for the Upper/Nautical Deck hall. It certainly adds a bit of class to the hall and the first test will be for the turkey dinner. The ONVC Secretary has sent a letter of thanks to the Holiday Inn for their generous gift. Sunday, November 28th, 2010. The ONVC would like to thank Colin Pardy and Sandy Rutherford for the donation of a previously enjoyed HD "Ready" 47" Projection TV. It was put to good use during the 98th Grey Cup party held at the Navy Club, once again, thank you Colin and Sandy. Wednesday, June 23rd, 2010. The ONVC would like to thank the Tuesday night Euchre players for the support we received this season. The June 13th Euchre Tournament was a great success, thanks Don (Wilson). Sunday, June 20th, 2010. The ONVC would like to thank Ken Gillespie and his friendly assistant Andy Bak for organizing another successful Golf Tournament. The rain pretty much held off and a excellent time was seemed to be had by all! Thanks boys, see you next year! Another season is done and another job well done by the "THURSDAY NIGHT FUN DART LEAGUE". As most of you know we had a lot of fun this year and we had funds left to purchase new dartboards for the Club, also give $500.00 to the Club to purchase a tree for the 100th Anniversary of the Canadian Navy which is now planted in Memorial Park close to the band shell. Lastly we had $508.60 left in our fund that I have turn over to the club to be put into the building fund as requested by you, The Darters. A BIG THANK YOU TO ONE AND ALL! SEE YOU ON SEPTEMBER 9th, 2010 at 7:00 PM. A huge "Thank You" on behalf of the Oshawa Navy Club Executive and members is extended to the members of the Fun League, who have again shared some of their fun among members and non-members alike. It has been on going for a number of years, and hopefully for more years to come. And especially for your kind donation of $500.00 donated to the Club for the expense of the tree, planting, and the plaque in the year 2010 as we celebrate the 100th anniversary of the Canadian Navy. This was most generous, and the tree will be a reminder to you of that generosity, and to Navy Club Members who will be reminded of the interest you have shown the club. Thank you all once again.